Chevrolet Corvair - модельный ряд, комплектации, подробные технические характеристики по годам выпуска как новых, так и автомобилей с пробегом. Chevrolet Corvair 2.3 Powerglide 2AT Coupe 2AT 80 л.с. 1960 г. 1960 г.
Chevrolet Corvair 2.3 Powerglide 2AT Sedan 2AT 80 л.с. 1960 г. 1960 г.
Chevrolet Corvair 2.3 Synchromesh 3MT Coupe 3MT 80 л.с. 1960 г. 1960 г.
Chevrolet Corvair 2.3 Synchromesh 3MT Coupe 3MT 95 л.с. 1960 г. 1960 г.
Chevrolet Corvair 2.3 Synchromesh 3MT Sedan 3MT 80 л.с. 1960 г. 1960 г.
Chevrolet Corvair 2.3 Synchromesh 3MT Sedan 3MT 95 л.с. 1960 г. 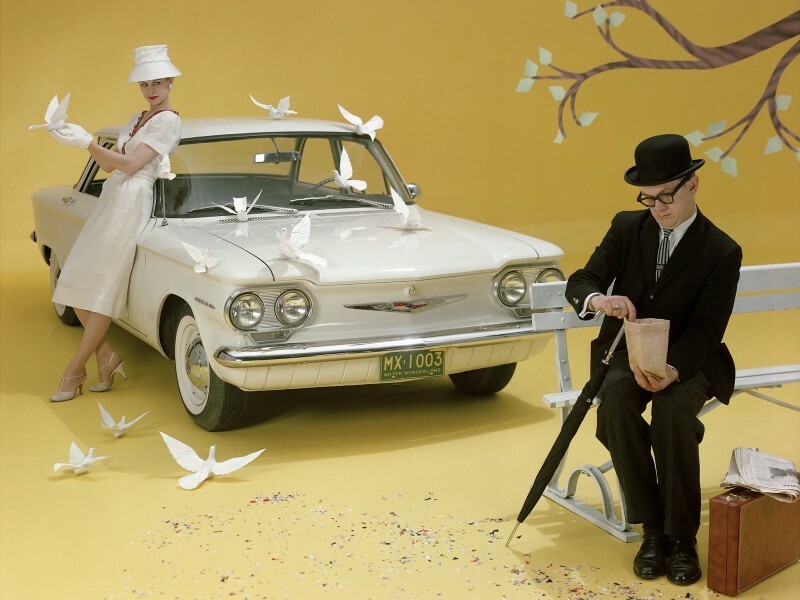 1960 г.
Chevrolet Corvair 2.4 3Synchromesh 3MT Cabriolet 3MT 102 л.с. 1962 г. 1962 г.
Chevrolet Corvair 2.4 3Synchromesh 3MT Cabriolet 3MT 80 л.с. 1962 г. 1962 г.
Chevrolet Corvair 2.4 3Synchromesh 3MT Cabriolet 3MT 102 л.с. 1963 г. 1963 г.
Chevrolet Corvair 2.4 3Synchromesh 3MT Cabriolet 3MT 80 л.с. 1963 г. 1963 г.
Chevrolet Corvair 2.4 3Synchromesh 3MT Coupe 3MT 80 л.с. 1961 г. 1961 г.
Chevrolet Corvair 2.4 3Synchromesh 3MT Coupe 3MT 98 л.с. 1961 г. 1961 г.
Chevrolet Corvair 2.4 3Synchromesh 3MT Coupe 3MT 102 л.с. 1962 г. 1962 г.
Chevrolet Corvair 2.4 3Synchromesh 3MT Coupe 3MT 80 л.с. 1962 г. 1962 г.
Chevrolet Corvair 2.4 3Synchromesh 3MT Coupe 3MT 102 л.с. 1963 г. 1963 г.
Chevrolet Corvair 2.4 3Synchromesh 3MT Coupe 3MT 80 л.с. 1963 г. 1963 г.
Chevrolet Corvair 2.4 3Synchromesh 3MT Fourgon 3MT 80 л.с. 1961 г. 1965 г.
Chevrolet Corvair 2.4 3Synchromesh 3MT Sedan 3MT 80 л.с. 1961 г. 1961 г.
Chevrolet Corvair 2.4 3Synchromesh 3MT Sedan 3MT 98 л.с. 1961 г. 1961 г.
Chevrolet Corvair 2.4 3Synchromesh 3MT Sedan 3MT 102 л.с. 1963 г. 1963 г.
Chevrolet Corvair 2.4 3Synchromesh 3MT Sedan 3MT 80 л.с. 1963 г. 1963 г.
Chevrolet Corvair 2.4 3Synchromesh 3MT Wagon 3MT 80 л.с. 1961 г. 1961 г.
Chevrolet Corvair 2.4 3Synchromesh 3MT Wagon 3MT 98 л.с. 1961 г. 1961 г.
Chevrolet Corvair 2.4 3Synchromesh 3MT Wagon 3MT 102 л.с. 1962 г. 1962 г.
Chevrolet Corvair 2.4 3Synchromesh 3MT Wagon 3MT 80 л.с. 1962 г. 1962 г.
Chevrolet Corvair 2.4 4Synchromesh 4MT Cabriolet 4MT 102 л.с. 1962 г. 1962 г.
Chevrolet Corvair 2.4 4Synchromesh 4MT Cabriolet 4MT 80 л.с. 1962 г. 1962 г.
Chevrolet Corvair 2.4 4Synchromesh 4MT Cabriolet 4MT 102 л.с. 1963 г. 1963 г.
Chevrolet Corvair 2.4 4Synchromesh 4MT Cabriolet 4MT 80 л.с. 1963 г. 1963 г.
Chevrolet Corvair 2.4 4Synchromesh 4MT Coupe 4MT 80 л.с. 1961 г. 1961 г.
Chevrolet Corvair 2.4 4Synchromesh 4MT Coupe 4MT 98 л.с. 1961 г. 1961 г.
Chevrolet Corvair 2.4 4Synchromesh 4MT Coupe 4MT 102 л.с. 1962 г. 1962 г.
Chevrolet Corvair 2.4 4Synchromesh 4MT Coupe 4MT 80 л.с. 1962 г. 1962 г.
Chevrolet Corvair 2.4 4Synchromesh 4MT Coupe 4MT 102 л.с. 1963 г. 1963 г.
Chevrolet Corvair 2.4 4Synchromesh 4MT Coupe 4MT 80 л.с. 1963 г. 1963 г.
Chevrolet Corvair 2.4 4Synchromesh 4MT Fourgon 4MT 80 л.с. 1961 г. 1965 г.
Chevrolet Corvair 2.4 4Synchromesh 4MT Sedan 4MT 80 л.с. 1961 г. 1961 г.
Chevrolet Corvair 2.4 4Synchromesh 4MT Sedan 4MT 98 л.с. 1961 г. 1961 г.
Chevrolet Corvair 2.4 4Synchromesh 4MT Sedan 4MT 102 л.с. 1963 г. 1963 г.
Chevrolet Corvair 2.4 4Synchromesh 4MT Sedan 4MT 80 л.с. 1963 г. 1963 г.
Chevrolet Corvair 2.4 4Synchromesh 4MT Wagon 4MT 80 л.с. 1961 г. 1961 г.
Chevrolet Corvair 2.4 4Synchromesh 4MT Wagon 4MT 98 л.с. 1961 г. 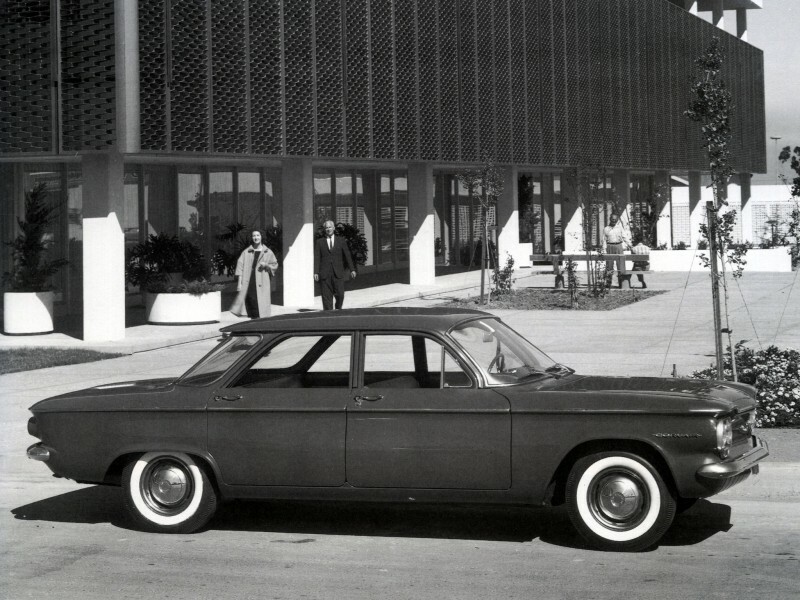 1961 г.
Chevrolet Corvair 2.4 4Synchromesh 4MT Wagon 4MT 102 л.с. 1962 г. 1962 г.
Chevrolet Corvair 2.4 4Synchromesh 4MT Wagon 4MT 80 л.с. 1962 г. 1962 г.
Chevrolet Corvair 2.4 Powerglide 2AT Cabriolet 2AT 80 л.с. 1962 г. 1962 г.
Chevrolet Corvair 2.4 Powerglide 2AT Cabriolet 2AT 84 л.с. 1962 г. 1962 г.
Chevrolet Corvair 2.4 Powerglide 2AT Cabriolet 2AT 102 л.с. 1963 г. 1963 г.
Chevrolet Corvair 2.4 Powerglide 2AT Cabriolet 2AT 80 л.с. 1963 г. 1963 г.
Chevrolet Corvair 2.4 Powerglide 2AT Cabriolet 2AT 84 л.с. 1963 г. 1963 г.
Chevrolet Corvair 2.4 Powerglide 2AT Coupe 2AT 80 л.с. 1961 г. 1961 г.
Chevrolet Corvair 2.4 Powerglide 2AT Coupe 2AT 80 л.с. 1962 г. 1962 г.
Chevrolet Corvair 2.4 Powerglide 2AT Coupe 2AT 84 л.с. 1962 г. 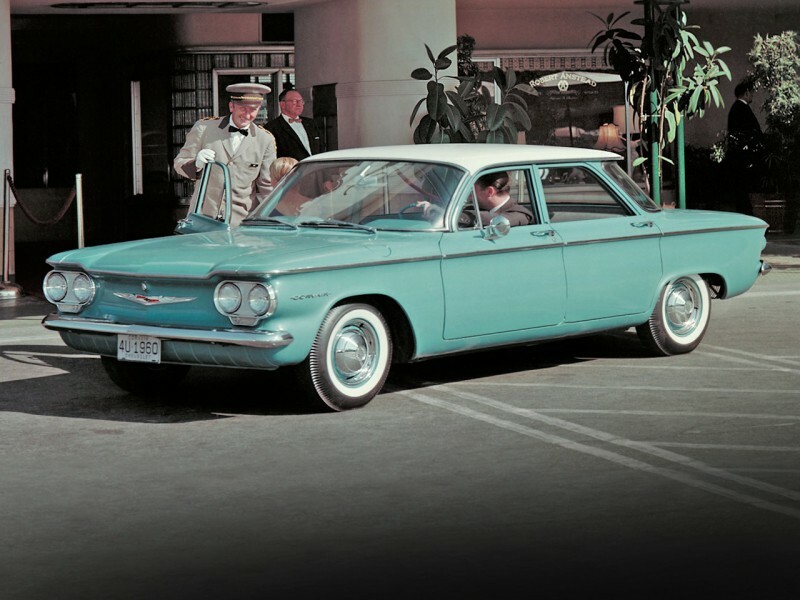 1962 г.
Chevrolet Corvair 2.4 Powerglide 2AT Coupe 2AT 102 л.с. 1963 г. 1963 г.
Chevrolet Corvair 2.4 Powerglide 2AT Coupe 2AT 80 л.с. 1963 г. 1963 г.
Chevrolet Corvair 2.4 Powerglide 2AT Coupe 2AT 84 л.с. 1963 г. 1963 г.
Chevrolet Corvair 2.4 Powerglide 2AT Fourgon 2AT 80 л.с. 1961 г. 1965 г.
Chevrolet Corvair 2.4 Powerglide 2AT Sedan 2AT 80 л.с. 1961 г. 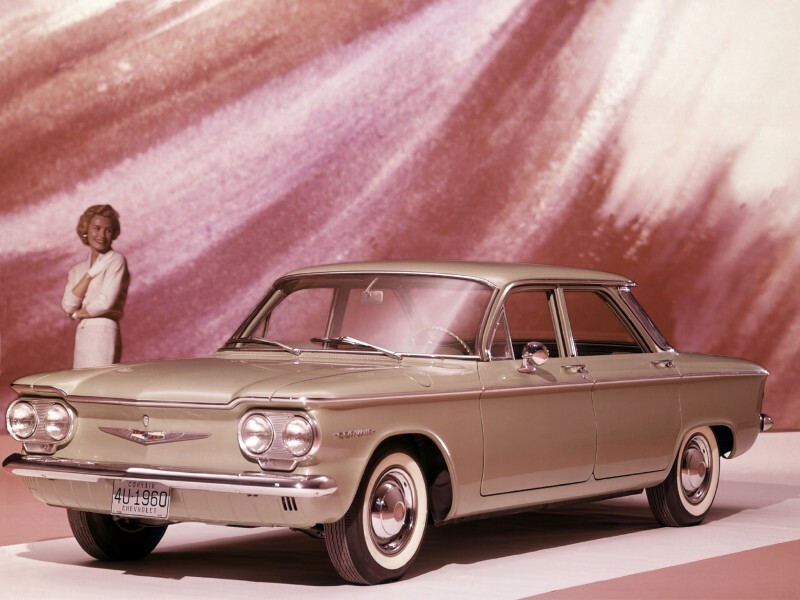 1961 г.
Chevrolet Corvair 2.4 Powerglide 2AT Sedan 2AT 102 л.с. 1963 г. 1963 г.
Chevrolet Corvair 2.4 Powerglide 2AT Sedan 2AT 80 л.с. 1963 г. 1963 г.
Chevrolet Corvair 2.4 Powerglide 2AT Sedan 2AT 84 л.с. 1963 г. 1963 г.
Chevrolet Corvair 2.4 Powerglide 2AT Wagon 2AT 80 л.с. 1961 г. 1961 г.
Chevrolet Corvair 2.4 Powerglide 2AT Wagon 2AT 80 л.с. 1962 г. 1962 г.
Chevrolet Corvair 2.4 Powerglide 2AT Wagon 2AT 84 л.с. 1962 г. 1962 г.
Chevrolet Corvair 2.4 Turbocharged 3MT 3MT Cabriolet 3MT 150 л.с. 1963 г. 1963 г.
Chevrolet Corvair 2.4 Turbocharged 3MT 3MT Coupe 3MT 150 л.с. 1963 г. 1963 г.
Chevrolet Corvair 2.4 Turbocharged 4MT 4MT Cabriolet 4MT 150 л.с. 1963 г. 1963 г.
Chevrolet Corvair 2.4 Turbocharged 4MT 4MT Coupe 4MT 150 л.с. 1963 г. 1963 г.
Chevrolet Corvair 2.7 3MT 3MT Cabriolet 3MT 110 л.с. 1964 г. 1964 г.
Chevrolet Corvair 2.7 3MT 3MT Cabriolet 3MT 95 л.с. 1964 г. 1964 г.
Chevrolet Corvair 2.7 3MT 3MT Cabriolet 3MT 110 л.с. 1965 г. 1965 г.
Chevrolet Corvair 2.7 3MT 3MT Cabriolet 3MT 140 л.с. 1965 г. 1965 г.
Chevrolet Corvair 2.7 3MT 3MT Cabriolet 3MT 95 л.с. 1965 г. 1965 г.
Chevrolet Corvair 2.7 3MT 3MT Cabriolet 3MT 110 л.с. 1966 г. 1969 г.
Chevrolet Corvair 2.7 3MT 3MT Cabriolet 3MT 140 л.с. 1966 г. 1969 г.
Chevrolet Corvair 2.7 3MT 3MT Cabriolet 3MT 95 л.с. 1966 г. 1969 г.
Chevrolet Corvair 2.7 3MT 3MT Coupe 3MT 110 л.с. 1965 г. 1965 г.
Chevrolet Corvair 2.7 3MT 3MT Coupe 3MT 140 л.с. 1965 г. 1965 г.
Chevrolet Corvair 2.7 3MT 3MT Coupe 3MT 95 л.с. 1965 г. 1965 г.
Chevrolet Corvair 2.7 3MT 3MT Coupe 3MT 110 л.с. 1966 г. 1967 г.
Chevrolet Corvair 2.7 3MT 3MT Coupe 3MT 140 л.с. 1966 г. 1967 г.
Chevrolet Corvair 2.7 3MT 3MT Coupe 3MT 95 л.с. 1966 г. 1967 г.
Chevrolet Corvair 2.7 3MT 3MT Coupe 3MT 110 л.с. 1966 г. 1969 г.
Chevrolet Corvair 2.7 3MT 3MT Coupe 3MT 140 л.с. 1966 г. 1969 г.
Chevrolet Corvair 2.7 3MT 3MT Coupe 3MT 95 л.с. 1966 г. 1969 г.
Chevrolet Corvair 2.7 3MT 3MT Sedan 3MT 110 л.с. 1964 г. 1964 г.
Chevrolet Corvair 2.7 3MT 3MT Sedan 3MT 95 л.с. 1964 г. 1964 г.
Chevrolet Corvair 2.7 4MT 4MT Cabriolet 4MT 110 л.с. 1964 г. 1964 г.
Chevrolet Corvair 2.7 4MT 4MT Cabriolet 4MT 95 л.с. 1964 г. 1964 г.
Chevrolet Corvair 2.7 4MT 4MT Cabriolet 4MT 110 л.с. 1965 г. 1965 г.
Chevrolet Corvair 2.7 4MT 4MT Cabriolet 4MT 140 л.с. 1965 г. 1965 г.
Chevrolet Corvair 2.7 4MT 4MT Cabriolet 4MT 95 л.с. 1965 г. 1965 г.
Chevrolet Corvair 2.7 4MT 4MT Cabriolet 4MT 110 л.с. 1966 г. 1969 г.
Chevrolet Corvair 2.7 4MT 4MT Cabriolet 4MT 140 л.с. 1966 г. 1969 г.
Chevrolet Corvair 2.7 4MT 4MT Cabriolet 4MT 95 л.с. 1966 г. 1969 г.
Chevrolet Corvair 2.7 4MT 4MT Coupe 4MT 110 л.с. 1965 г. 1965 г.
Chevrolet Corvair 2.7 4MT 4MT Coupe 4MT 140 л.с. 1965 г. 1965 г.
Chevrolet Corvair 2.7 4MT 4MT Coupe 4MT 95 л.с. 1965 г. 1965 г.
Chevrolet Corvair 2.7 4MT 4MT Coupe 4MT 110 л.с. 1966 г. 1967 г.
Chevrolet Corvair 2.7 4MT 4MT Coupe 4MT 140 л.с. 1966 г. 1967 г.
Chevrolet Corvair 2.7 4MT 4MT Coupe 4MT 95 л.с. 1966 г. 1967 г.
Chevrolet Corvair 2.7 4MT 4MT Coupe 4MT 110 л.с. 1966 г. 1969 г.
Chevrolet Corvair 2.7 4MT 4MT Coupe 4MT 140 л.с. 1966 г. 1969 г.
Chevrolet Corvair 2.7 4MT 4MT Coupe 4MT 95 л.с. 1966 г. 1969 г.
Chevrolet Corvair 2.7 4MT 4MT Sedan 4MT 110 л.с. 1964 г. 1964 г.
Chevrolet Corvair 2.7 4MT 4MT Sedan 4MT 95 л.с. 1964 г. 1964 г.
Chevrolet Corvair 2.7 Powerglide 2AT Cabriolet 2AT 110 л.с. 1964 г. 1964 г.
Chevrolet Corvair 2.7 Powerglide 2AT Cabriolet 2AT 95 л.с. 1964 г. 1964 г.
Chevrolet Corvair 2.7 Powerglide 2AT Cabriolet 2AT 110 л.с. 1965 г. 1965 г.
Chevrolet Corvair 2.7 Powerglide 2AT Cabriolet 2AT 140 л.с. 1965 г. 1965 г.
Chevrolet Corvair 2.7 Powerglide 2AT Cabriolet 2AT 95 л.с. 1965 г. 1965 г.
Chevrolet Corvair 2.7 Powerglide 2AT Cabriolet 2AT 110 л.с. 1966 г. 1969 г.
Chevrolet Corvair 2.7 Powerglide 2AT Cabriolet 2AT 140 л.с. 1966 г. 1969 г.
Chevrolet Corvair 2.7 Powerglide 2AT Cabriolet 2AT 95 л.с. 1966 г. 1969 г.
Chevrolet Corvair 2.7 Powerglide 2AT Coupe 2AT 110 л.с. 1965 г. 1965 г.
Chevrolet Corvair 2.7 Powerglide 2AT Coupe 2AT 140 л.с. 1965 г. 1965 г.
Chevrolet Corvair 2.7 Powerglide 2AT Coupe 2AT 95 л.с. 1965 г. 1965 г.
Chevrolet Corvair 2.7 Powerglide 2AT Coupe 2AT 110 л.с. 1966 г. 1967 г.
Chevrolet Corvair 2.7 Powerglide 2AT Coupe 2AT 95 л.с. 1966 г. 1967 г.
Chevrolet Corvair 2.7 Powerglide 2AT Coupe 2AT 110 л.с. 1966 г. 1969 г.
Chevrolet Corvair 2.7 Powerglide 2AT Coupe 2AT 140 л.с. 1966 г. 1969 г.
Chevrolet Corvair 2.7 Powerglide 2AT Coupe 2AT 95 л.с. 1966 г. 1969 г.
Chevrolet Corvair 2.7 Powerglide 2AT Sedan 2AT 110 л.с. 1964 г. 1964 г.
Chevrolet Corvair 2.7 Powerglide 2AT Sedan 2AT 95 л.с. 1964 г. 1964 г.
Chevrolet Corvair 2.7 Turbocharged 3MT 3MT Cabriolet 3MT 150 л.с. 1964 г. 1964 г.
Chevrolet Corvair 2.7 Turbocharged 3MT 3MT Cabriolet 3MT 180 л.с. 1965 г. 1965 г.
Chevrolet Corvair 2.7 Turbocharged 3MT 3MT Cabriolet 3MT 180 л.с. 1966 г. 1967 г.
Chevrolet Corvair 2.7 Turbocharged 3MT 3MT Coupe 3MT 180 л.с. 1965 г. 1965 г.
Chevrolet Corvair 2.7 Turbocharged 3MT 3MT Coupe 3MT 180 л.с. 1966 г. 1967 г.
Chevrolet Corvair 2.7 Turbocharged 4MT 4MT Cabriolet 4MT 150 л.с. 1964 г. 1964 г.
Chevrolet Corvair 2.7 Turbocharged 4MT 4MT Cabriolet 4MT 180 л.с. 1965 г. 1965 г.
Chevrolet Corvair 2.7 Turbocharged 4MT 4MT Cabriolet 4MT 180 л.с. 1966 г. 1967 г.
Chevrolet Corvair 2.7 Turbocharged 4MT 4MT Coupe 4MT 180 л.с. 1965 г. 1965 г.
Chevrolet Corvair 2.7 Turbocharged 4MT 4MT Coupe 4MT 180 л.с. 1966 г. 1967 г.